Facade Al-Khazneh (The Treasury), Petra, Jordan, c. 2nd century BC- 2nd century CE. Image courtesy of Bernard Gagnon on Wikipedia. My little sister recently returned from a study abroad in the Middle East during which she was able to visit, among other things, the ancient ruins at Petra in Jordan. I’m so glad that she got to visit this site; I hope to be able to go here myself one day. Although it is difficult to date the rock-cut tombs found at Petra, they are thought to have been made sometime between the 2nd century BC and the 2nd century CE, when the local group the Nabateans were at their wealthiest. 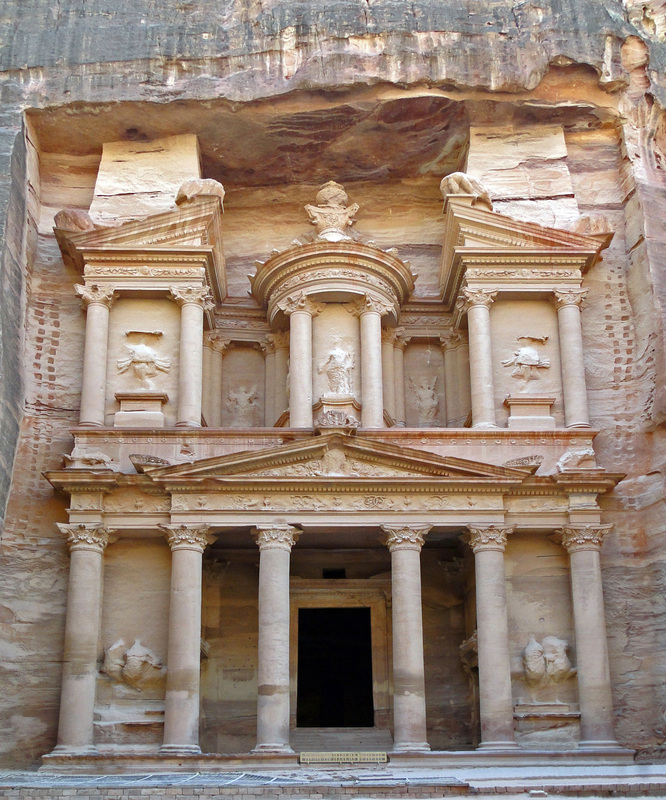 Although some textbooks and scholars find that some of these rock-cut tombs (particularly the famous Al-Khazneh (“The Treasury,” shown above) and Al-Deir (“Monastery”)) are examples of Roman architecture, others feel that most of the buildings in Petra were built before the Roman annexation in 106 CE. This drama is especially apparent to me at Al-Khazneh due to the dynamic broken pediment, as well as the emphasis on movement. I see a lot of movement in the upper area of the facade, which contains a rhythm due to the pattern of projecting and recessing architectural segments. This movement is mimicked in the lower part of the façade, in which the frieze projects and recesses as it winds atop Corinthian columns. Additionally, the deep porch on the lower level creates an interesting contrast of light (hitting the Corinthian columns) and dark (shadow in the porch recess), which reminds me of the tenebrism found in Baroque art of the 17th century. 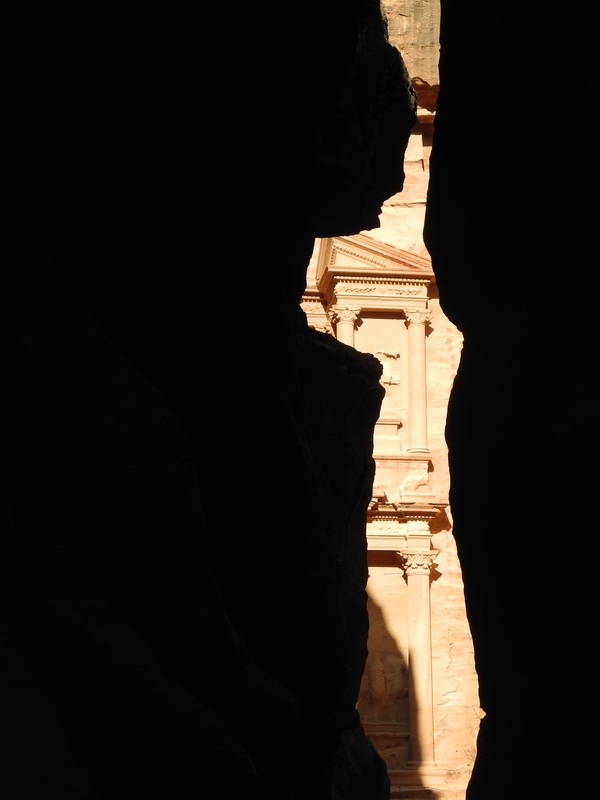 Partial view of façade Al-Khazneh (The Treasury) from the Siq (Canyon), Petra, Jordan, c. 2nd century BC – 2nd century CE. Given the theatricality of this style and its geographic location, it is no wonder that Steven Spielberg used Al-Khazneh as the location for the Holy Grail in Indiana Jones and the Last Crusade! I can also see why this dramatic building is associated with legends that pirate loot and pharaonic treasure were once held here (which accounts for the “Treasury” nickname for this building). To complete the dramatic effect, visible bullet holes can be seen on the exterior (shot by Bedouins at a stone urn (the “tholos”), in hopes of releasing the legendary stored treasure. Perhaps the bullet holes add a bit of visual “movement” and texture to the façade today as well! Jealous! I’ve always wanted to go here. And you’re right, the architectural style is very baroque.